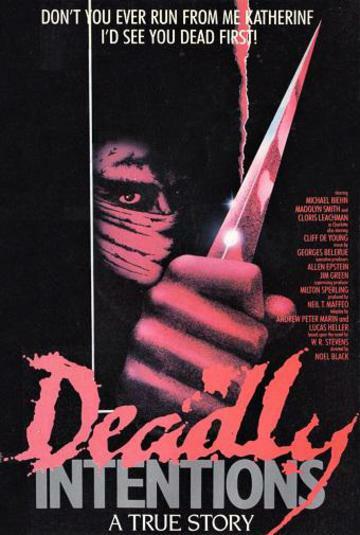 The Original Full 1985� 178 minutes Version.�Starring�Michael Biehn and Madolyn Smith. Starring Michael Biehn, Madolyn Smith, Morgana King, Kevin McCarthy and Cloris Leachman. Young, naive Katherine (Madolyn Smith) discovers the horrible truth about her seemingly "perfect" husband, Dr. Charles Raynor (Michael Biehn), when she learns of his secret plot to murder her. Now, understanding that her life is in the balance, she must prove to the police, who are understandably skeptical that the good doctor is actually a psychopathic killer. But time is quickly running out for Katherine as the duplicitous Charles makes plans for her demise. Also Available Deadly Intentions Again starring Harry Hamlin as Dr. Charles Raynor.